Once the hub of the home, fireplaces are now largely decorative. And while many modern fireplace walls are without them, a mantel is a traditional architectural focal point of a room. They provide a wonderful opportunity for festive Christmas decorations. It is a way to introduce a unique theme and color to your holiday décor. Made to dress up the fireplace mantle, they can also be used for any long surface, including shelves, entertainment centers, and for deep window sills, so think about tying together a room with more than one. 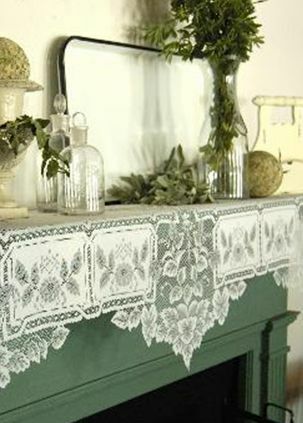 Mantle scarves come in many styles including my favorite white, lace-trimmed traditional. 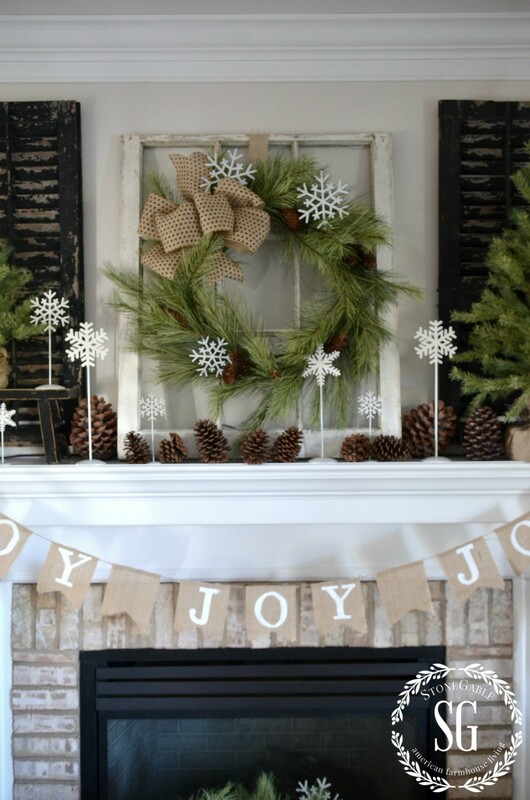 A fun idea for the top of the mantle is to create a Christmas, or winter theme, vignette. Your imagination can run wild with this! Beautiful woodland motif with pine branches, reindeer statues or candle holders, woodland animal ornaments, and pine cones is an idea that brings forest creatures into the front room. Old toys: blocks, cars, etc. Formal and symmetrical, a wreath flanked with matching topiary is perfect for a Williamsburg look. It is also easy to do yourself! 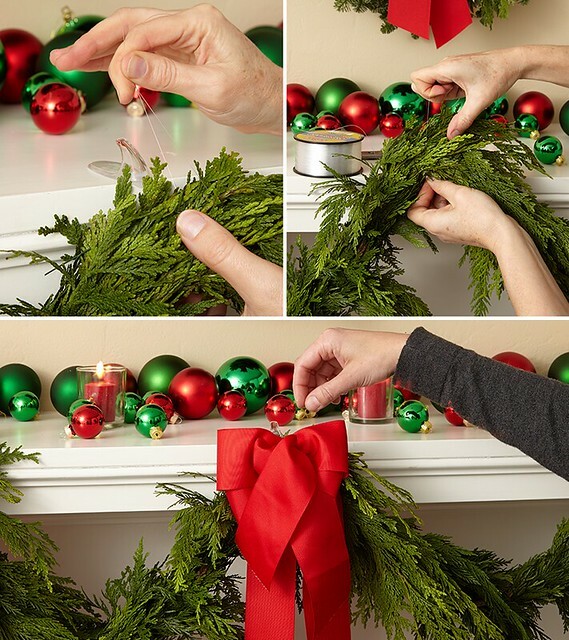 Forms are available and can be decked with false evergreen sprigs or real and pinned with red velvet bows for a festive look. Or buy one of many ready-made items from hobby stores and floral departments. Popular because it is so easy to do, combining a garland with pots of flowers and dotting with colorful Christmas ball ornaments makes a color coordinated look that is inexpensive and full looking. Be sure to add plenty of the colorful bows in rich grosgrain or velvet. Rustic and country? Try grapevine balls and burlap bows along with the glass in colors that match the tree theme. 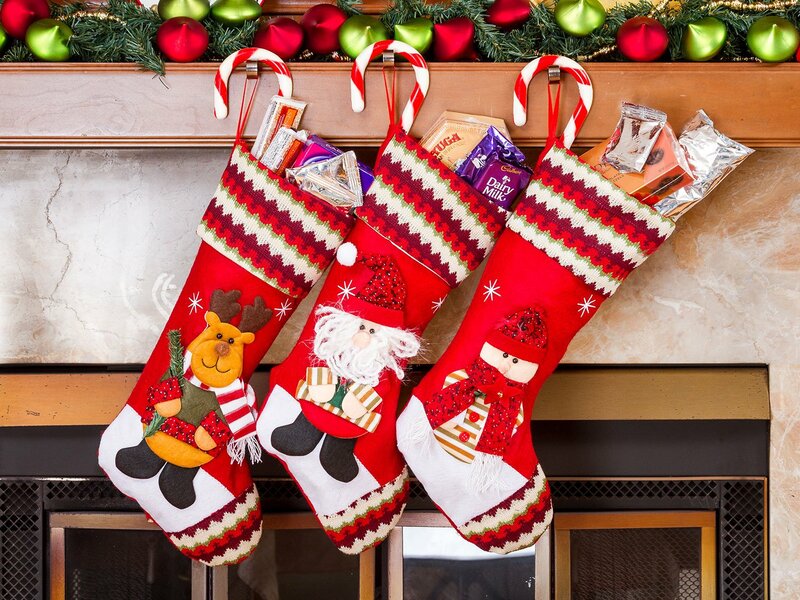 The custom for many families are the Christmas stockings, that come in many colors, are often personalized and hung on decorative hooks. Plenty of room for crafting and making this a focus of the family's yearly ritual. 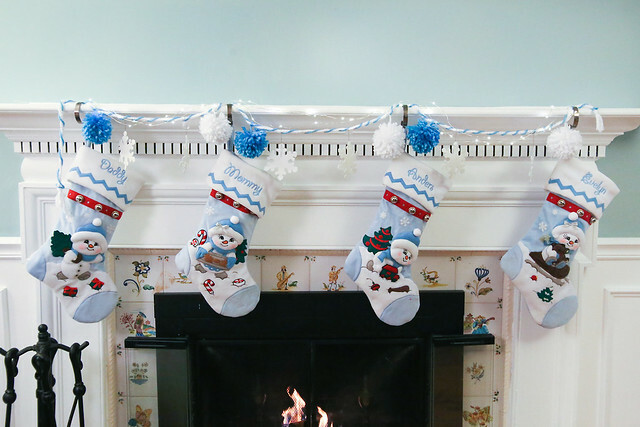 Matching stocking in the snowman theme. Add a banner to the topiary, pine cones, and snowflakes. Another "Banner look" shows how this idea combines with many rustic or casual styled looks. This one from "Sweet Something Designs". I like the way it lets the Christmas tree hod center stage, yet creates its own impact. Make a sign, add lights- magicalAdd a sign that you make displaying your faith, your Christmas message. Amanda also has a page of instructions on making a stenciled wooden sign that will guide you to DIY. This could be done in different colors, but the minimal theme of white, and silver with only the tan and green background makes for a very elegant look, don't you think? Add a garland and lights, hang shiny balls from white strings- and its a cozy, contemporary look. Come see my Christmas pinterest board.